Here's a pattern that I had wanted to publish with way more photos of the sootball doing cool stuff but I ran out of the novelty yarn I needed and I can't find any in my town. I could order more online but I'll wait to see if I get lucky and Walmart restocks their yarn shelves first! supply list contains items you may not need depending on which sootball you make so be sure to glance over the pattern all the way to the end before starting. Read me ~> Work in continuous rounds, do not join. Have any questions or if you come across a mistake in the pattern please leave a message in the comment section below. Read me ~> Add in a marker at the end of row 2 and move that marker at the end of every row. I just use a short length of yarn and pull it through the last stitch I put in at the end of every row. Using your blunt end yarn needle, run it along the body now to pull up any fur that has been caught inside the stitching. f/o leaving a long tail for sewing. Do not stuff the leg. Bend florist wire OR 2 pipe cleaners and push the bend all the way to the end of the foot. Cut the excess pipe cleaner off. If you want the sootball to stand firmly on it's own then use florist wire.. any gauge as long as you can bend it with your fingers and it holds it's shape on it's own. Leave a little length past the edge of the leg so that the wires go into the body a bit before the leg touches the body. This adds strength but please do not use wire if giving the sootball to a small child. Bend the end of the leg at about the 5th row so you have a foot. Using a length of black yarn wrap it tightly from the top of the foot (about the 5th row) to about 1/4 inch from the top of the leg. Knot off and hide yarn tails inside leg. sl st next st and f/o leaving a tail for sewing unless you glue the eyes in place. 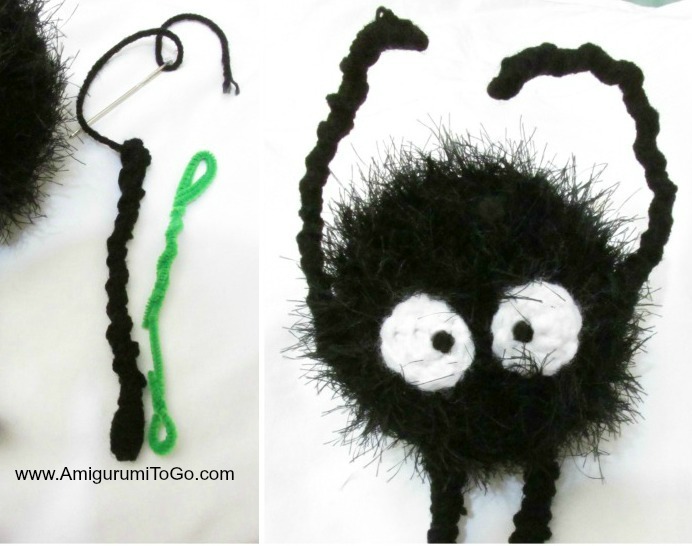 If you glue them then just cut the yarn tail up shorter and tuck it behind the eye. For the pupil I made a french knot with black yarn. I made the arms with 4 pipe cleaners, 2 pipe cleaners per arm. Do not use the full length of the pipe cleaner. Bend each end over, including each bend mine are about 6 inches long. Because I didn't have black on hand I just wrapped the pipe cleaners with black yarn. After wrapping I also made a long chain with about 40 -45 chains and wrapped the chain around the pipe cleaners as well. This added a bit of strength as well as a lumpy pattern that somewhat matched the legs. 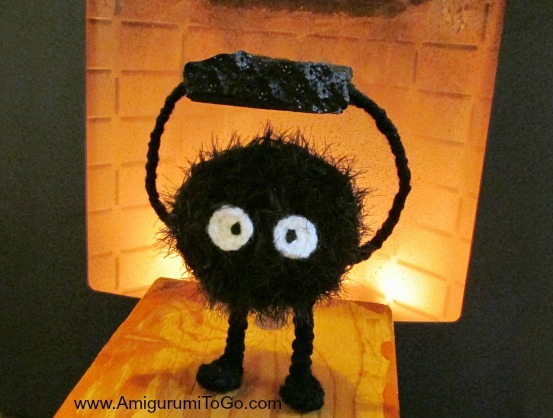 Sew the arms so that they point upward, so they can hold the coal without a struggle. I used a piece of Styrofoam that I painted black with acrylic craft paint. 2 coats covered it well, let the first coat dry first before adding the 2nd coat. Before painting the piece though check and see how the piece looks over the head, take note where the arms will be and use a pen or a pencil to make indents for the hands to slide into. Make these deep enough so the arms won't slip out easily. Try it out with the arms before painting. Once it's ready push the arms into the 2 indents and you're done! If the hands begin to slip out you can tie them together by knotting a piece of yarn to the end of one hand and using a yarn needle pull the yarn right through the Styrofoam and through the other indent. Thread it through the other hand, push the hands in place and pull on the yarn tail until it's tight then knot it off. Weave the yarn tail into the arm and cut the end free. ch 17 and f/o leaving a long tail that you will weave in and out of the chains all the way to the other end. You will now have 2 yarn tails on one end. Sew these to the body. You can also add a black bead to the end of the chain before weaving the one yarn tail to the other end. I added 2 beads, one on each leg as pictured. You can also add a yarn loop on the top of his head to hang him up for display. I hope you enjoyed this pattern! 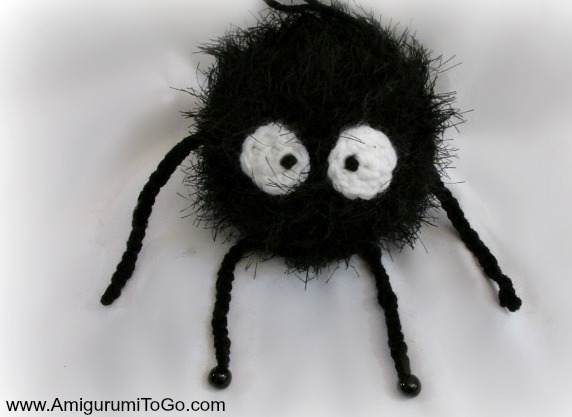 If you make a Sootball please post pictures on my facebook page, I'd love to see! I love you amigurumi! This sootball is so cute, like your other patterns. I've got a blog too: cdecositas.blogspot.com (I started it on Tuesday XD). Sorry, it's in Spanish.